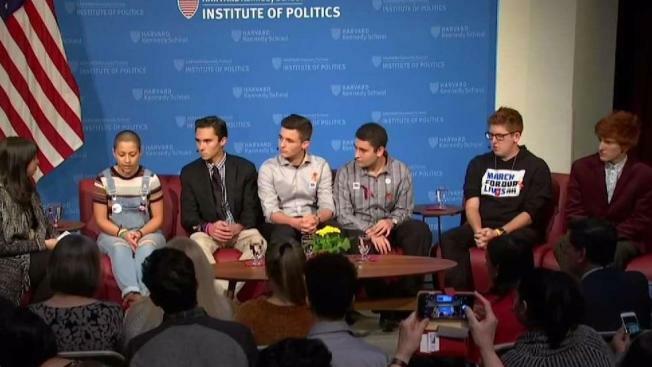 Students who survived the school shooting in Parkland, Florida, were in Cambridge, Massachusetts, to speak at Harvard. Students who survived last month's deadly school shooting in Parkland, Florida, were in Cambridge, Massachusetts, Tuesday to speak about gun control at Harvard University. "It is sad to say things are getting back in the groove, back how they used to be, and that is what we are trying to prevent from happening nationwide," said Jacquline Corin, a 17-year-old junior at Marjory Stoneman Douglas High School. Corin was inside the building on Valentine's Day when 17 people were killed, including one of her close friends. Tuesday morning, yet another school shooting had an impact on Corin. Two Maryland students were injured and a 17-year-old gunman was killed. "I was really, really upset and frustrated because I know how those kids feel, hiding in their classrooms and not knowing if they are going to get shot," Corin said. "I know how it feels to hear the sirens echoing, and they are going to have to live with that for the rest of their lives." Other panelists included Stoneman Douglas students Emma Gonzalez, David Hogg, Ryan and Matt Deitsch, Cameron Kasky, and Alex Wind. Earlier Tuesday, Massachusetts alumni of Stoneman Douglas were at the state house, where they also hoped to influence change. Gun law advocates say a common sense "red flag law" would allow family members and law enforcement to seek a court order temporarily restricting a person's access to guns when they pose a danger to themselves or others. Six states now have red flag laws in place and many more states are in the process of passing similar laws. Six alumni speakers were joined by Massachusetts Rep. Marjorie Decker, the lead sponsor of the Extreme Risk Protective Order bill. The press conference was part of a series of "Eagle Pride Week" events leading up to Saturday's March for Our Lives.